Winners are Mr.Harshdeep Singh from 8th standard and Ms. Panika Jain from 9th standard. The award winning Campaign at International Operator’s Conference, Lisbon, Connect Net Champs is raising awareness on cyber security amongst students, parents and teachers by associating with schools across Punjab. 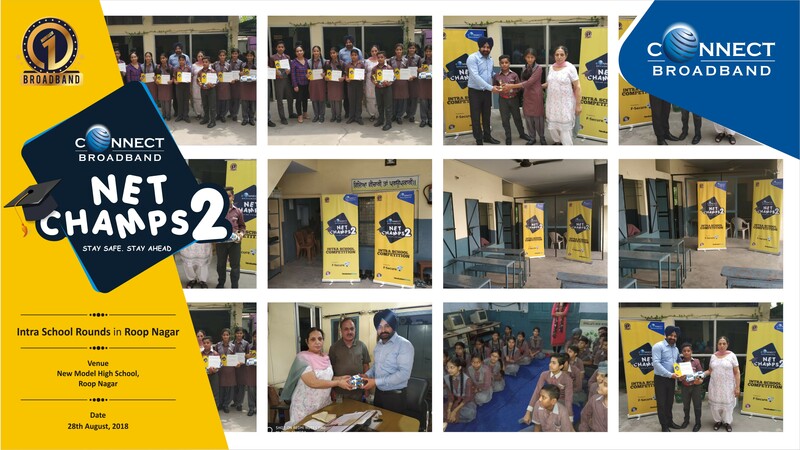 Roop Nagar,August 28,2018: Edition 2 of Connect Net Champs - a program that addresses Internet Security among school students – kicked off its 12th session on Cyber Security at New Model School , Roop Nagar The session included a thrilling Quiz contest for students. Two candidates were shortlisted for the next round from the school. In an interactive session with the expert, children at the school learnt various nuances of the internet world. Topics of discussion included the potential risks related to internet and how to avoid these, exposure to inappropriate material, harassment and bullying, physical molestation, legal and financial, viruses and hackers. Additionally, important guidelines were imparted on how children can avoid online risks, rules for online safety, and how to be a smart internet user. Net Champs is a program to engage children with the purpose of educating them on the nuances of the World Wide Web and how to utilize their potential with information available just a click away. The program is structured in three very interesting tiers; First round is the school round, followed by the second round which is the city round and the third round is the Grand finale. In each round, there are exciting prizes to be won. This year, Connect Broadband is in search of a ‘Net Champ’ via conducting a Chandigarh-Punjab wide mega contest. CONNECT also provides Wireless Broadband service across Punjab. Offering high speed internet through a wireless medium, CONNECT Wireless Broadband enables users to access internet through their Laptops, PCs, Tablets, Wi-Fi enabled phones in the wireless vicinity & FTTH which is a Broadband telecommunications system based on fiber-optic cables and associated optical electronics. The technology reaches the boundary of the living space, such as a box on the outside wall of a home. Quadruple play of high-speed broadband, high-definition video, unlimited 'anywhere' telephony, and real-time surveillance are a few key take-always for users.